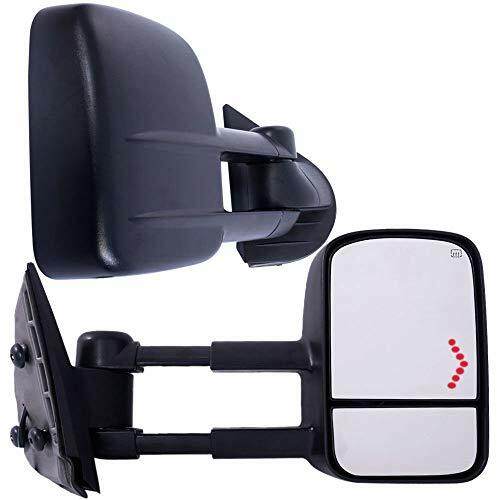 Specifications: -Come as a pair,fits both LH (Driver Side) & RH (Passenger Side) -Manual Operation- main mirror, Dual Arm -Dual Glass-(Flat Glass + Convex Glass) -Manual Telescoping & Folding, Aluminum Material Base. -Made by ultra strong and light weight black durable textured ABS plastic. Feature: 1.Convex glass Provides better and wider angle of rear view. 2.Top quality reflective glass ensures less distortion. 3.Built to strict quality control standards 4.Dramatically Improve styling and appearance. 5.Professional installation is highly recommended. 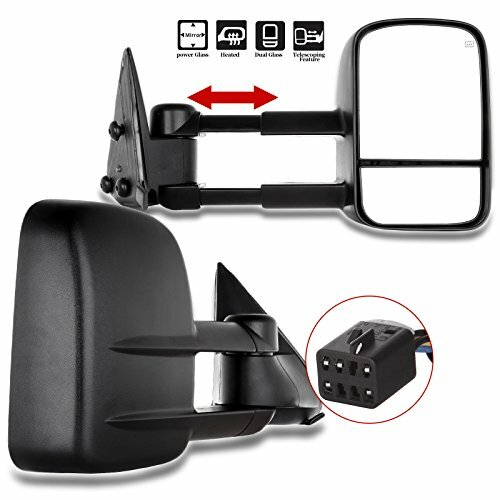 Brand NEW fitting for the following years and models: 2007-2013Chevy Silverado 1500(Just Fit 07 New Body Style) 2007-2014Chevy Silverado 2500 HD/ 3500 HD(Just Fit 07 New Body Style) 2007-2014Chevy Suburban 1500/ 2500 2007-2014Chevy Tahoe 2007-2013Chevy Avalanche 2007-2013GMC Sierra 1500(Just Fit 07 New Body Style) 2007-2014GMC Sierra 2500 HD/ 3500 HD(Just Fit 07 New Body Style) 2007-2014GMC Yukon XL 1500/ 2500 2007-2014GMC Yukon Note: 1.These mirrors will only work for vehicles with these exact options. 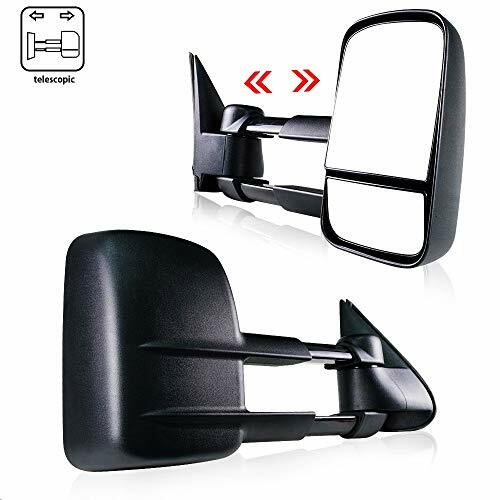 If you do not have the options listed, these mirrors may not function properly. 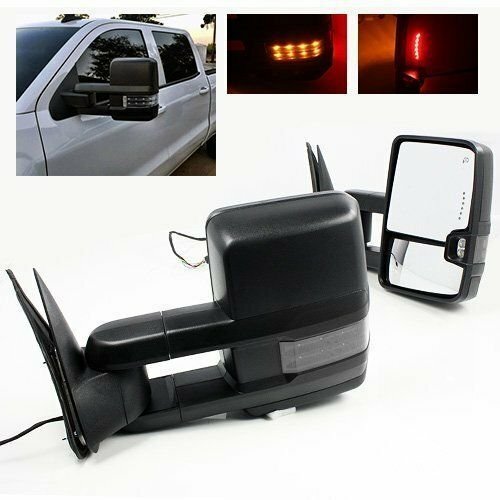 Fit For: 1999-2007 CHEVY SILVERADO 1500/2500/3500 (OLDER CLASSIC STYLE 07 MODELS) 1999-2007 GMC SIERRA 1500/2500/3500 (OLDER CLASSIC STYLE 07 MODELS) 2000-2006 CHEVY TAHOE 2000-2006 CHEVY SUBURBAN 1500/2500 2000-2006 GMC YUKON XL Specifications: Come as a pair,Fits both LH (Driver Side) & RH (Passenger Side) Manually telescoping mirrors Manually adjusted lower mirrors Injection molded textured black plastic housing to ensure a solid construction Built to strict quality control standards Direct replacements Unheated Features: -Convex glass Provides better and wider angel of rear view -High Quality reflective glass ensures less distortion and a clear horizon -Perfect Choice for your aftermarket upgrade,show your individuality Package Included: 2 X Towing Mirrors(Passenger And Driver Side) Support Bracket & Self-washer Nut are included Notice: The installation sequence can be a little bit hassle. Porfesional installation is highly recommended. 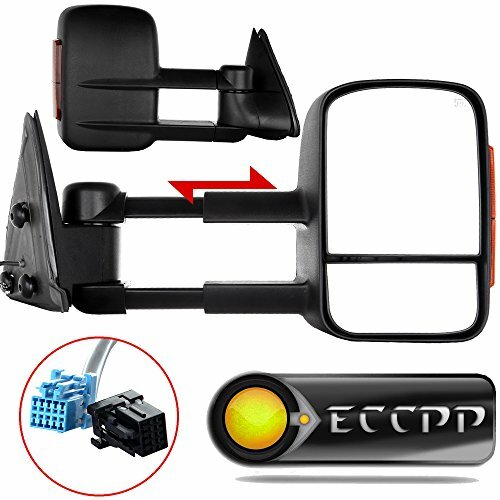 Specifications: 1.Come as a pair,fits both LH (Driver Side) & RH (Passenger Side) 2.Power Operation- main mirror, Dual Arm 3.Dual Glass-(Flat Glass + Convex Glass) 4.Arrow Signal Light in Glass- as turn signal light 5.Heated (works with the rear defrost like the original) 6.Manual telescoping, Aluminum Material Base. 7.Made by ultra strong and light weight black durable textured ABS plastic. 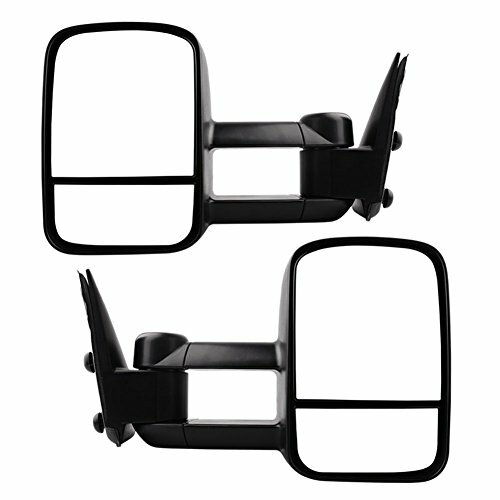 Features: 1.Convex glass Provides better and wider angle of rear view. 2.Top quality reflective glass ensures less distortion. 3.Built to strict quality control standards. 4.Dramatically Improve styling and appearance. 5.Professional installation is highly recommended. 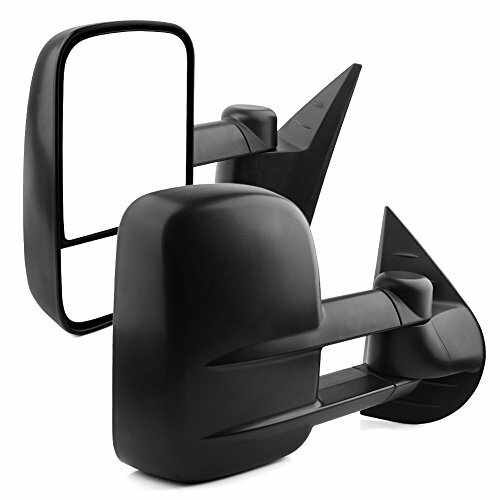 Brand NEW fitting for the following years and models: 2003-2006 Chevy Silverado/GMC Sierra Pickup all models 2007 Chevy Silverado/GMC Sierra Classic Models 2003-2006 Chevy Suburban/Avalanche 1500 2500 2003-2006 Chevy Tahoe, GMC Yukon, GMC Yukon XL 1500 2500, Cadillac Escalade ESV EXT Package List: 1x Pair Towing Power Heated Side View Mirrors LED Signal Note: These mirrors will only work for vehicles with these exact options. 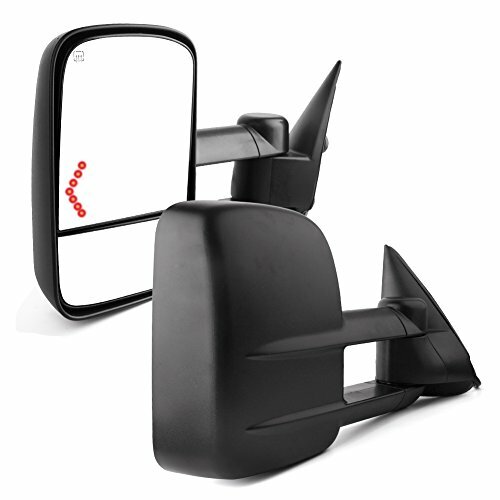 If you do not have the options listed, these mirrors may not function properly. 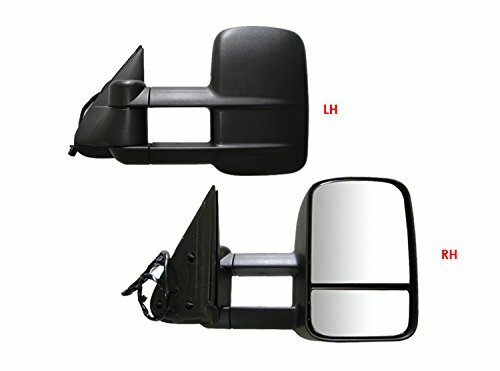 Shopping Results for "Telescoping Tow Mirror"